This class allows a general X-STEP engine to run generic functions on any interface norm, in the same way. It includes the transfer operations. I.e. it gathers the already available general modules, the engine has just to know it. 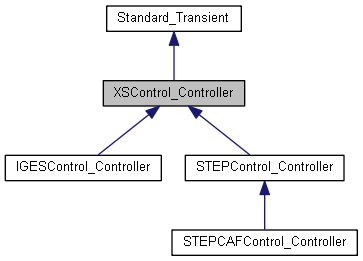 The important point is that a given X-STEP Controller is attached to a given couple made of an Interface Norm (such as IGES-5.1) and an application data model (CasCade Shapes for instance). Initializing with names <theLongName> is for the complete, official, long name <theShortName> is for the short name used for resources. Returns the Actor for Read attached to the pair (norm,appli) It can be adapted for data of the input Model, as required Can be read from field then adapted with Model as required. Returns the Actor for Write attached to the pair (norm,appli) Read from field. Can be redefined. Records a Session Item, to be added for customisation of the Work Session. It must have a specific name. <setapplied> is used if is a GeneralModifier, to decide If set to true, will be applied to the hook list "send". Else, it is not applied to any hook list. Remark : this method is to be called at Create time, the recorded items will be used by Customise Warning : if <name> conflicts, the last recorded item is kept. Reimplemented in IGESControl_Controller, and STEPControl_Controller. Tells if a value of <modetrans> is a good value(within bounds) Actually only for shapes. Returns the help line recorded for a value of modetrans empty if help not defined or not within bounds or if values are free. Creates a new empty Model ready to receive data of the Norm Used to write data from Imagine to an interface file. Implemented in IGESControl_Controller, and STEPControl_Controller. Tells if <obj> (an application object) is a valid candidate for a transfer to a Model. By default, asks the ActorWrite if known (through a TransientMapper). Can be redefined. Records <me> in a general dictionary under a name Error if <name> already used for another one. Returns the Controller attached to a given name Returns a Null Handle if <name> is unknown. Returns an item given its name to record in a Session If <name> is unknown, returns a Null Handle. Sets mininum and maximum values for modetrans (write) Erases formerly recorded bounds and values Actually only for shape Then, for each value a little help can be attached. Changes names if a name is empty, the formerly set one remains Remark : Does not call Record or AutoRecord. Records the name of a Static to be traced for a given use. Takes one Shape and transfers it to an InterfaceModel (already created, e.g. by NewModel) Default uses ActorWrite; can be redefined as necessary Returned value is a status, as follows : Done OK , Void : No Result , Fail : Fail (e.g. exception) Error : bad conditions , bad model or null model. Takes one Transient Object and transfers it to an InterfaceModel (already created, e.g. by NewModel) (result is recorded in the model by AddWithRefs) FP records produced results and checks.